THE SUPPORT ORGANISATION FOR TRISOMY (S.O.F.T.) is a voluntary group dedicated to providing support, assistance and information for families of children diagnosed and born with Patau’s Syndrome (T13) and Edward’s Syndrome (T18). Babies born with these syndromes often have serious life threatening conditions with development delay and a limited life expectancy. Support is provided during pre-natal diagnosis, during the child’s life and after the child’s passing. 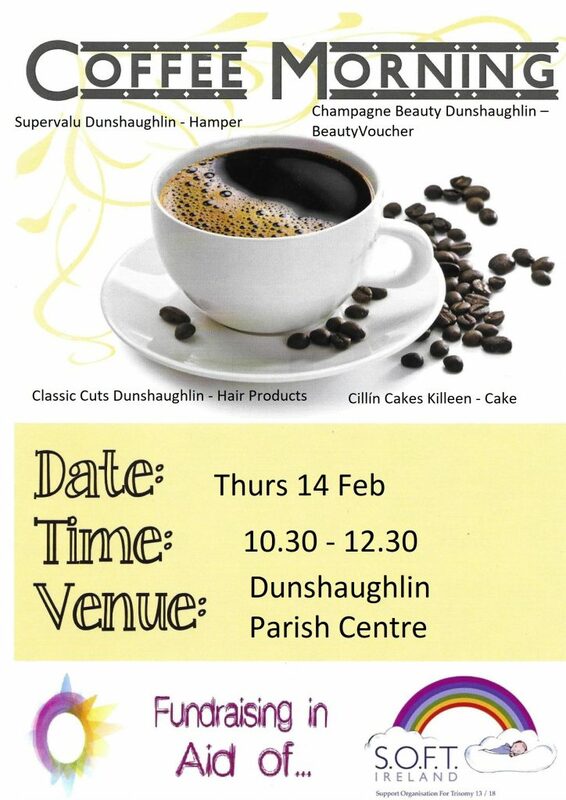 The coffee morning and raffle will be held in the Pastoral Centre, Dunshaughlin from 10.30 – 12.30pm Thursday 14 February. All support welcome.